Wellness in mind and body, as well as spiritual wellness is becoming an essential awareness in society. India is well known for its studies in the art of meditation, yoga and natural medicines. Delving into India's rich history and culture of natural medicine, beauty and wellness, The Indian Spa is a must have guide to India's luxury spas and spa treatments. The Indian Spa is the first book of its kind to cover the plethora of wellness therapies that originated in the Indian subcontinent. The country's four healing systems --Ayurveda, Unani, Siddha and Tibetan traditional medicine are covered, along with yoga, meditation and more. 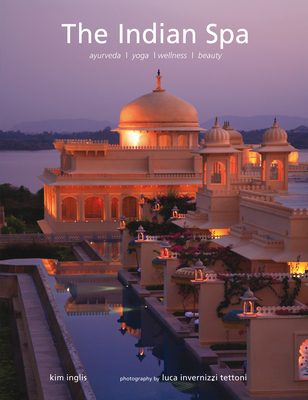 A comprehensive chapter also highlights the exotic places where you can try the treatments, including luxury spas, resorts, Ayurvedic institutions, yoga retreats and more. Kim Inglis is a Singapore-based writer specializing in Asian subject matter. She is the author of several titles, including Bali Home, Bali by Design and Tropical Hotels. Luca Invernizzi Tettoni has had his work published in over 100 books, including The Ultimate Spa.